With the exploding popularity of the real time multiplayer game Clash Royale, the race to dominate enemies is becoming challenging. As you start to level up in the game, difficulty in defeating enemies starts to increase. At this point, to be honest, winning matches in clash royale requires you to build the best decks and building those require you to spent some good amount of money in in-app purchases. Players whose chose to thrown in some money have unfair advantage over those who don’t. To prevent this to happen, most of the non spending players start searching clash royale hacks in order to get free gems. 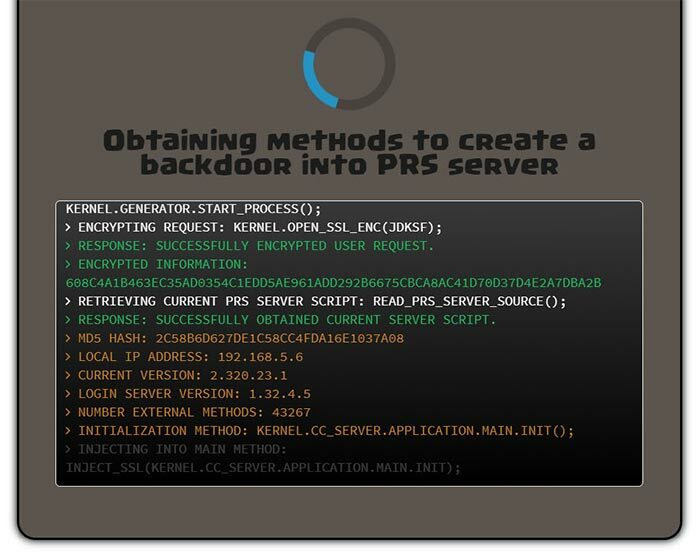 So, now we take a look at these hacks and reveal you the truth what works and what doesn’t. 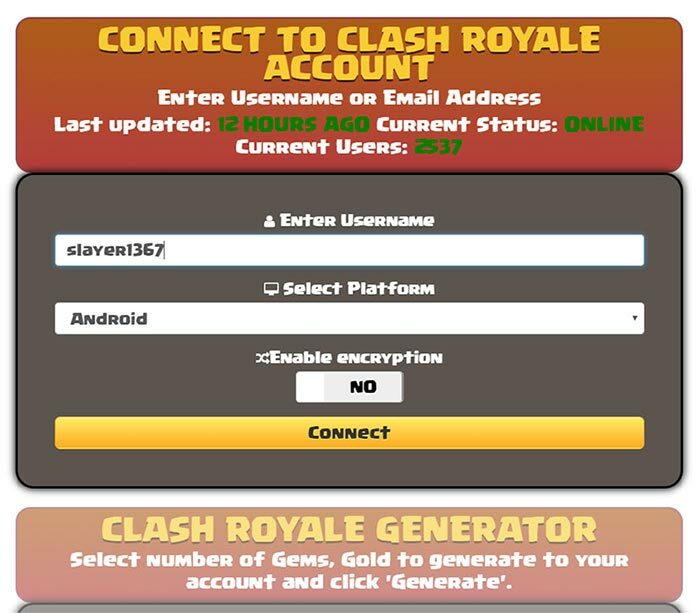 There are various hacks, cheats website available & a simple search on google like free gems for clash royale revealed such websites. So, we made a list of 50 such websites and tested them each of them carefully. Along with our team, we also sent these websites to our 10 friends and noted down to what they said. These were the results of the test conducted. The First part of the form required us to enter the username and enter platform. So, we went ahead and filled the first part and pressed connect. It showed us a loading screen and showed that the tool was connect to our username. The second part of the form required us to select how many gems and gold we want to be credited to our account. We went ahead and clicked generate. 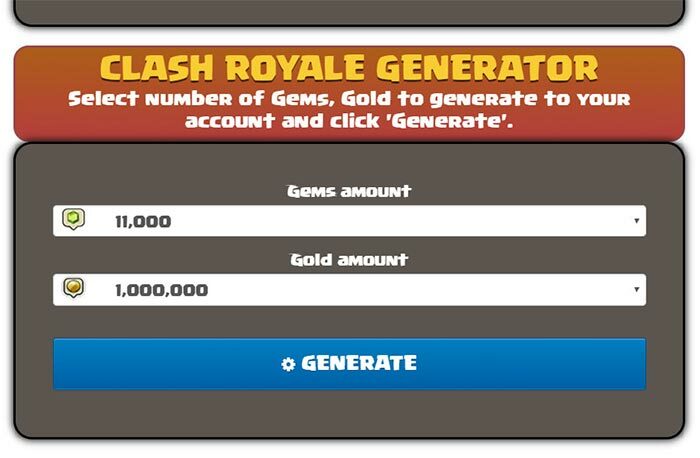 When we clicked generate a console would show up and acted like it was hacking into the servers of clash royale. We tested this again and found the console would run even when there was no internet connection. So, this was the first sign that this was just fake. However, we went ahead to find more signs that this was completely scam. Now the comes the part where we had to verify that we were human and not a bot. Depending on the device you were on you would get different task. If you were on desktop, you would need to fill out a survey & if you were on mobile device, you were required to download a app and run for 30 seconds. We went ahead and did the task. However, no resources were credited to the account. So, this was the second sign that clash royale cheat tools were completely useless. When you complete these tasks, the owner of the website makes money. He is an affiliate to promote incentive offer. So, the moment you complete any task the affiliate makes money. You can read more about it. Just google affiliate marketing and things will start to make sense. Some of the websites actually installed a virus/malware on their computers. While some of them posted screenshots that they really got the resources through hack tools but eventually those images were made on photoshop. Few of the sites showed a video proof but still that was manipulated on some video editing software. Here’s a example how would it look. Some of them had created fake comments just to make the user believe that the hack actually works. Some tools show that some users recently redeemed given number of gems and gold. However, this is done to fool you into believing that some users are really get the resources. So, we are 100% convinced that these tools gives nothing. However, we did found out a way to get free gems in clash royale the legit way. Keep on reading the next section to find out how! If you have read the above section carefully, you are well aware now that these clash royale hacks don’t work. If you have directly jumped to this section then no worries, just keep in mind that any website assuring you that it hacks the game to give you gems & gold is just a scam. So, let me get into the way to actually get free resources. Once you download the app, your account automatically gets created and you are presented with alot of tasks to complete like downloads games, complete surveys, watch videos or complete some trial offers. For every task completed, you are given points which ranges from 10 to 1250 points. Once you reach minimum amount of points, you can exchange it for google play store card. Using the google play store card you can buy the gems, gold and other resources in clash royale. Now, the question comes which is the best royalty app to use that earns you atleast $100 to $200 per month ? As compared to other apps, this has the best exchange ratio. So, for just 2500 coins you can get $15 Play Store Card(This apps calls their points as “coins”). Where as other apps give you just $1 for 1000 points. We had read reviews about this app and many people have actually earned above $150 within a month. However, this will depend on the location you live. They have generous 2 Level referral system. You get 20% coins for the friends you invite directly and 10% coins of the friends who refer their friends. They have a 4.6 rating on play store which is better as compared to the other reward apps. Based on these criteria we decided to give this app a shot and find out whether it actually sends us the play store card. Complete the featured offers as soon as you download the app. They are very limited and we earned 300 coins just from it. It assures you that you will get coins in 1 minute. We did complete trial offer. A valid credit card was required but we did receive what we put into and no misuse of the credit card was done. We referred our 5 friends and did make 500 coins just by referring. So, the more you refer the more you earn. Remember you get 20% only when your friends complete download offers, surveys or trial offers. Surveys were really high paying but there will some cases that you will be kicked out of the survey because you didn’t meet the survey criteria. So, overall we were able to gather 3100 coins within 7 days and then we went ahead to redeem $15 Gift Card. The app said gift card will be sent within 36 to 48 hours. So, we waited and guess what we got paid within 24 hours. 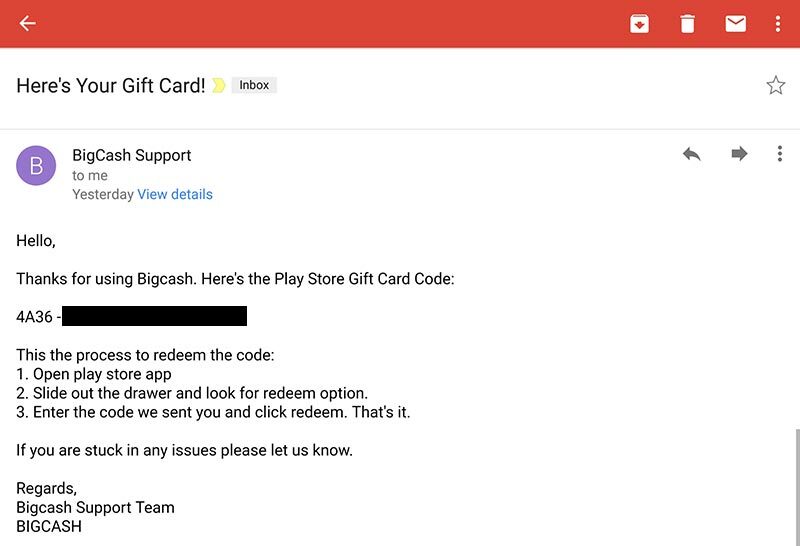 Here’s the email I received from Bigcash with the play store code in it. So, now we went ahead, redeemed the play store card in play store and there it was we got the balance straight away and bought some gems through our google play balance. Currently the app is only available on play store. They are working on the same to bring it to iphone users. PS: We just checked our app again and got 1145 coins just from referral. So, bigcash is really a good way to earn some cash and spend it on in-app purchases. Even if you have ample of resources you still need a good tactic & good card decks. Here are some of the tips we recommend you follow! 1. You should maintain a balance between expensive and cheap units. It is never advised to go all in with expensive units or go all in with cheap units. 2. If your playing style is aggressive then you must choose card deck consisting of fast moving units and if the style is defensive then go with the units that can withstand damage. 3. Once you get your ideal card deck keep upgrading all the units whenever possible. Using money to improve quickly is a way to go option. 4. In order to open chest quickly you can use jewels to unlock them & jewels can be earned by completing achievements. 5. When the match starts wait until the entire elixir fills up only then starting getting out the units. 6. During the match, if you are successful in destroying any one enemy’s tower, then immediately switch to defensive mode. You must focus on holding enemy’s attack. 7. If some enemy troops are attacking your tower you must deploy your troops only when the tower cannot withstand the attack. 8. Mislead your enemies by making use of taunts. In conclusion, we would like to say that don’t trust clash royale hack tools & keep in mind that nothing in this world is for free. Everything has to earned. We hope this article helped you alot. If you have question feel free to ask in the below comments.